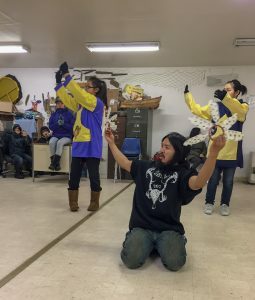 About six years ago community members in Hooper Bay worked together to revive a Yup’ik dance group for young people. The idea was to help reconnect kids to their culture, teach about the effects of alcohol and drugs, and prevent suicide. And it has worked –but not with every kid. 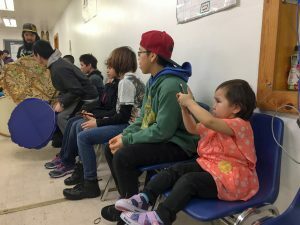 In early March, the youth group gathered at the Youth and Elders Building in Hooper Bay for dance practice for the first time in a long while. One of their members died by suicide in the fall. Memorials to the young man named Patrick adorned the walls of the one-room building. A psalm and a drawing of a brightly colored rainbow were dedicated to him. On the opposite wall, a butcher-paper banner was covered in handprints and notes saying how he helped everyone and had a wonderful laugh. That evening, the dance group started their practice with one of his favorite songs. His friend, Gideon Green, led the group, saying practice isn’t the same without him. Gideon is a leader in the dance group and one of the main singers. He and Patrick were some of the first kids to join about six years ago. Community members started the group after a couple of local people died by suicide to help support the youth and give them hope and something to do. People around town, they say it has helped. One young woman said it stopped her from misbehaving and spending too much time with TV and video games. Now, she teaches the little ones to dance and sew. 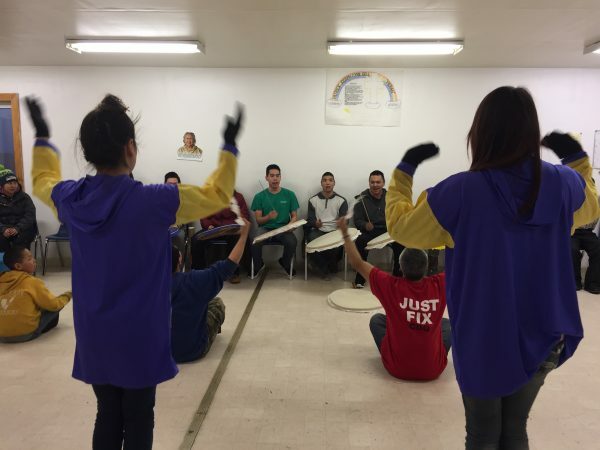 Gideon passes on the songs he learned from the elders and teaches the boys to drum. And that’s part of the reason why people dance. There’s an adult dance group in town as well as the youth group. 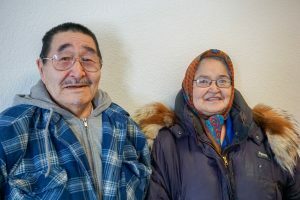 Hooper Bay elder and dance leader Margie Bell participates in both. She explained through a story that dancing heals. One Sunday her body was aching but she went to dance practice anyhow, not intending to participate. Margie said it’s not just the physical movements and the connections with history that help. Dancing is nourishing because people are together to share their feelings, talk through what’s troubling them, and connect on a spiritual level. But that doesn’t mean a youth dance group is a cure-all for the entire community. Being in a dance group won’t fix everything. Adolescence, life, and suicide are complicated. But it provides support that keeps young people, like Gideon, coming back. And on the days he doesn’t feel up to it, he said he doesn’t really have a choice. “Because if I don’t come, my phone’s gonna be crazy. They’re gonna be like ‘Come to practice. We need you!’ ‘Hurry up and get up here!’ They’ll start texting me like crazy,” Gideon said, laughing. Gideon misses his friend. They grew up together. They drummed together. He’s coming to accept that his friend has passed. And with that, he and the other young men started singing another song. If you or someone you know is thinking about suicide, call Alaska’s Careline at 1-877-266-4357. You can ask for help.